salads Archives - Bring It! I hate being duped. As when people say, “These black bean brownies or date/cocoa truffles or chickpea chocolate chip cookies will fool you!” I’m all about dates and black beans and chickpeas stretching themselves into baking pans, and dressing up as treats, but don’t try to pass them off as anything like the original. We’re friends. We can be honest on this. So, with that little tirade out of the way we move on to cauliflower, the multitasking food imposter du jour. I tried in vain to make a palatable buffalo cauliflower, and my family breathed a fiery sigh of relief when I gave up. You have no doubt heard of cauliflower “rice,” made by pulverizing the florets in the food processor then cooking/steaming the whole shebang. It’s fine, but it’s not rice, and I resent being made to pretend it’s rice. However, when it comes to couscous, I’m all about pretending. After all, what is couscous but pasta pretending to be a grain? It’s such an understudy already that usurping its identity is almost a favor. So cauliflower, come on in to my food processor and take the stage. A local Hanover High grad Ellen Jackson just came out with The Lemon Cookbook, and the Valley News published this recipe of hers. I’ve made it about four times, never entirely correctly, and loved it every time. Time #5 I actually took a picture. It’s great right away, a few hours later and the next day, and you have to work really hard to screw it up. I even made it with a bag of frozen cauliflower when the fresh stuff was going for $7 at the Coop. ($7? 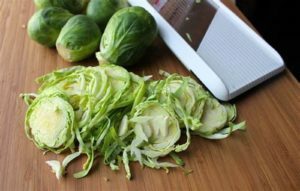 Do you have a hidden camera in the cruciferous section?) At any rate, all of the above makes it a Bring It all-star. A few changes/notes, because we have to: The key to toasting the cauliflower well is ample surface area, so dig out your largest pan. (Yes, the one at the bottom of the pile. You’re a few weeks in to that beach body routine so I know you can do it.) Cauliflower heads vary wildly, and I got way more than 4 cups out of mine. I used it all, brushing that big, used pan lightly with oil and toasting the extra separately. I also don’t add the other 2 Tbsp of oil at the end of the recipe. Five Tbsp of oil in a vegetable dish puts us in the tempura range, and at that point you might as well just eat the fries you’d rather have anyway. Ok, here we go! In a large, wide skillet over medium heat, toast the almonds, stirring frequently, until they smell nutty and are golden brown, about 7 minutes. Set the nuts aside and wipe out the pan. Warm 3 tablespoons of the oil over medium-high heat. When the oil is hot, add the cauliflower and salt. Sauté, stirring frequently, until the cauliflower pieces are toasted and tender, 12 to 15 minutes. Remove the pan from the heat and immediately add the garlic and zest, stirring well to distribute the flavors throughout. Season with additional salt and pepper, and allow the cauliflower to sit for at least 15 minutes, partially covered, for the flavors to develop. It is excellent at room temperature or can be rewarmed briefly over medium-high heat before serving. As with the making of this salad, you have to try pretty hard to mess it up in transport. And it’s good at room temperature. Hello picnics! This entry was posted in Salads and Sides, Veggie Delight and tagged cauliflower couscous, picnic fare, salads on May 21, 2015 by Edie Morgan. Minty Snap Pea Salad and Spring Training. Spring Training. Oh baby. Inspiring? Depressing? Hopeful? Daunting? All of the above? At least it can be tasty. I have a friend who, at the end of ski season, assessing the toll of too many fries and cheeseburgers and not enough training, used to wish for a week on an island with a bag of oranges. I’m feeling her pain. But as much as I need it, I’m not getting that island. I am, however, going to Mexico in a mere three weeks. As if that hard deadline wasn’t daunting enough, the Title Nine catalog arrived. For me that catalog is usually about 30 percent inspiring and 70 percent depressing. Given my circumstances, however, I’m trying to embrace the inspirational aspect of seeing the hard-bodied microbiologist/organic baker/pro surfer/mother-of-four riding her skateboard to the beach in a cute clingy dress. This is the long way of saying that it’s salad week here. I had this salad last week at my sister’s house in CA, where Meyer lemons are free for the taking off neighborhood trees. Pure fantasy. It comes from an old issue of Cook’s Country, an off-shoot of the notoriously meticulous Cook’s Illustrated. I included the link but forget about getting any free content from these cats. Cook’s Country tests the hell out of every recipe, which means two things: a. Every recipe is the most perfect version of what it can be; and b. you have to follow the recipe exactly. This is not a problem for my sister, who gives her recipes the respect they deserve, but it is an issue for a serial slacker like myself. Not surprisingly her version turned out way better than mine, so I’ve added some cautionary notes (in italics) based on my freelancing. My version was still darned good, but hers was better. And if you’re going to be eating salads for three weeks they might as well be as good as they can be. 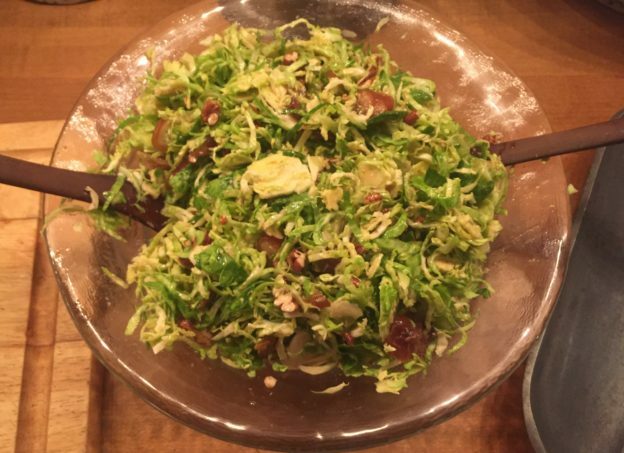 Speaking of salads, now is a great time to try the kale and brussels sprouts salad if you haven’t already. It’s more of a fall thing, but it’s green and fibrous and delicious, all of which work for spring. In a leap of faith and a show of hope, I sent back the swim dress/muu-muu and ordered board shorts and a suit. We’ll see how it goes. Peas: Combine 4 cups water and 4 cups ice in a large bowl; set aside. Bring 4 quarts water to a boil in a large pot over high heat. Add peas and 1 Tbsp salt (regular, not kosher) and cook until crisp tender, about 2 minutes (I overdid mine by about a minute. Not ideal). Drain peas then transfer to ice bath and cool completely (yeah, they mean completely. If they are the tiniest bit warm the goat cheese shmoozes over everything instead of keeping its crumbly integrity.) Remove peas from water, pat dry with kitchen towel (drying is also key to cheese/pea interface) and cut in half crosswise. At this point the peas can be refrigerated in a Ziploc bag for up to two days. Dress salad: Whisk mint, shallot lemon zest and juice, mustard, honey and oil in a large bowl. Add peas and cheese to bowl and toss to combine. Season with salt and pepper (remember the seasoning step). Serve chilled or at room temperature. The salad can be refrigerated in an airtight container for 1 day. Make it all ahead and bring it. Or, if you need to prep it ahead, bring peas, dressing and cheese in separate containers and combine before serving. This entry was posted in Salads and Sides, Veggie Delight and tagged salads, spring training, sugar snap peas on April 20, 2015 by Edie Morgan.